The time for a handicapped accessible van is getting here quickly. William is getting too heavy for Braley to pick up high enough to put him in a car seat. He is just dead weight and Braley isn't strong. All we need is for her to hurt her back! The very good people at First United Methodist Church in Macon (where Braley grew up) has organized this Love Offering. There will be 15 churches in the county participating. Actually, I didn't know there WERE 15 churches in the county. This effort has really humbled us, and we feel that it's a "God Thing." 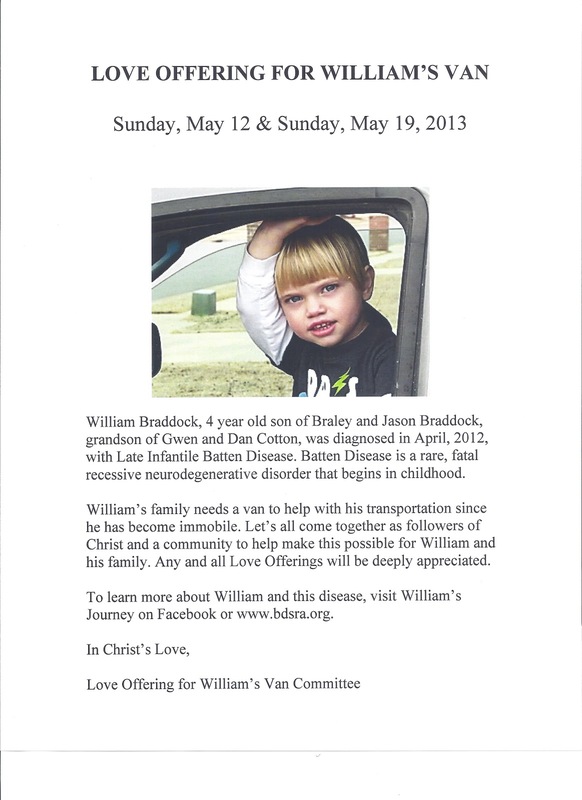 Seems that God is putting William on people's hearts, and they are responding. This isn't the only fundraiser being conducted. A couple of Braley's childhood friends have started selling T-shirts online. The profits from this effort will be going towards the Van Fund. God is GOOD! I have been married 15 years to my best friend and I am a stay-at-home mother of two children, 11-year old Addie and 5-year old William. They keep me busy for sure. 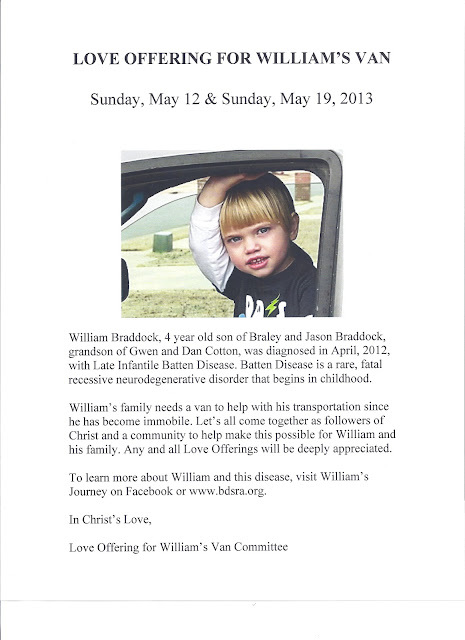 William has been diagnosed with Late Infantile Batten Disease, a fatal genetic disorder. It's a disease we had never heard of, and one with which we have become quite familiar.